Motorola’s last two tablets were launched in late 2011, being called Xoom 2 in Europe, and Droid Xyboard in the US (where they were exclusively sold by Verizon). Since then, Motorola Mobility was bought by Google, and is now in the process of being acquired by Lenovo. While we don’t know if there’ll ever be another new Motorola tablet, sources from China have it that the company had plans to introduce a new slate at some point - although it eventually cancelled its release. The cancelled Motorola tablet was recently spotted in some live photos, and we can see that it has a Kevlar rear case - just like the last Motorola Droid smartphones introduced by Verizon. Speaking of, this slate was supposed to be available at Verizon, as the carrier’s logo (including the 4G LTE label) is visible on its back, alongside a camera with LED flash. Reportedly, the tablet’s powered by a quad-core processor of unknown provenience - and that's all we know about its features. The device seems to have a 10-inch display, while being thinner than Apple’s iPhone 5s (7.6mm). 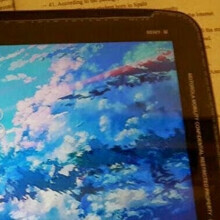 Take a look at the alleged Moto Xoom 3 tablet in the slideshow below, and let us know if you'd wanted Motorola to release it. *wipes tear from eye* I would have bought one! I bought the first Xoom tablet and let me tell ya it's been the worse electronic device ever produced. Moto made a bunch of promises and never kept them. Does it come standard with fingerprints and a permanent light reflection or is that just an option? Let's take it to the next level, CarbonFibre. I'm assuming this is what was in the package from those non-Edward Norton commercials DROID commercials last year after the new DROIDs came out. I'm still tablet-less & was gonna get this but obviously it's not coming out. They should have released it. I had the original Xoom WiFi version and it was built like a champ. i have been using moto razr xt910 for 2 years, it's good. i use mokee OS(andriod basis， 4.4.2) now, it's better than android 4.0.2.